Ramon Manon's career was short, 47 appearances over parts of four seasons. He also never got above single-A. But, over those four seasons, his overall record ended up respectable, even though he served mainly as a reliever. Manon ended his career with a 13-2 record. 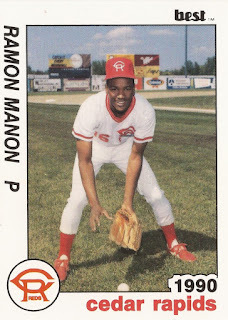 Manon's career began in 1988, signed by the Reds as free agent out of his native Dominican Republic. He played his first season in the rookie Gulf Coast League. There, he went 2-1, with a 2.51 ERA in 16 relief appearances. He also picked up two saves. Manon returned to the Gulf Coast League for 1989, getting another 11 outings. This time, though, he started six games. He went 6-1, with a 1.67 ERA in 54 innings of work. Moving to single-A Cedar Rapids for 1990, though, Manon's ERA increased to 4.54 in 19 relief appearances, 39.2 innings of work. He also picked up one more save. Manon is credited with time in one more season, a single 4.2-inning appearance in 1991, ending his professional career.